The development of best practice recommendations by the Corporate Governance Council (CGC) of the Australian Stock Exchange in 2003 clearly linked corporate regulators' concerns about good governance to the concept of corporate social and environmental responsibility. The CGC recommended that one way to demonstrate good governance was to use the annual report to disclose information to all legitimate stakeholders. This paper reports on the quantity and categories of environmental information disclosed in the corporate annual reports of 41 Australian companies across 8 industry groups covering the period 1983-2003. 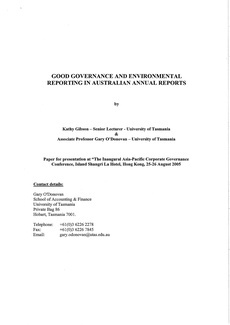 The time period covered has seen the importance of good corporate governance practice in relation to the protection of the environment escalate as demonstrated by the introduction of separate environmental and sustainability reports, the advent of triple bottom line reporting, changes in environmental legislation and the occurrence of major environmental incidents, such as the Exxon Valdez in Alaska and OK Tedi river disasters in Papua New Guinea. Findings of the study are discussed in relation to the importance of stakeholder, legitimacy and political economy theories of accounting and governance as possible explanatory factors for increasing disclosures. annual reports, environmental reporting, stakeholder, governance, legitimacy, political economy.